Soulful and bluesy, whimiscle and witty, imaginative and thought provoking music. JoAnn Vaccaro is a folk singer that has performed hundreds of shows, written over three albums of music, and released them all under her own Indie- label, Dwelling Records. JoAnn is known for her witty lyrics, comical approach to connecting with an audience, and sincerity in song. 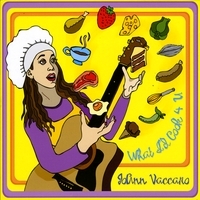 Her newest release, "What I'd Cook 4 u" (2009) blends humor with depth. Songs such as "Coffee Shop" depict the etiquette of open mic culture, "What I'd Cook 4 U", a creative love song about feeding one's heart and loved ones and "My Salmon Powered Automobile" a song that uses outside the box thinking to solve the problem of the $3.00 gallon of gasoline. Other titles such as "Second Chance" show a much deeper side. In an effort to try and get as many dogs and cats adopted and placed into good homes, JoAnn wrote the song "Second Chance" about an older cat slated to be euthanized if he was not adopted. Songs like this stir the emotions of listeners, and as a result, JoAnn uses the power of song to change the world around her for the better. "Believe" is a ballad that speaks to following a dream and seeing it through to fruition.